A recent protest in Oakland against a proposed coal terminal at the port. The California State Senate voted today to urge the California Public Employees Retirement System and California State Teachers Retirement System to divest from coal companies due to their massive greenhouse gas emissions that are fueling climate change. The two pension fund giants together manage almost half a trillion in assets. Both funds hold multimillion-dollar stakes in coal mining companies including Peabody Energy, Arch Coal, and Cloud Peak Energy. 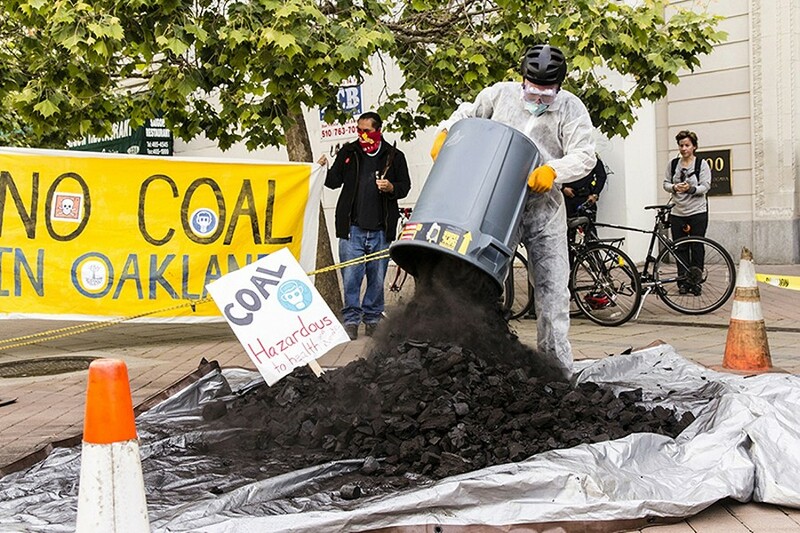 “California has prohibited its energy companies from buying or importing coal power, and the state’s funds should match that,” said state Senator Kevin de Leon, the bill’s sponsor, to a climate conference in Oakland last December. Scientists have identified coal as the single biggest source of greenhouse gas emissions driving global climate change. Coal mining and burning also produces harmful air and water pollutants, such as sulfur dioxide and mercury. For these reasons many institutional investors have already committed to divesting from coal as a first step, including the multibillion-dollar endowments of Stanford University and the University of Washington. The state Senate’s vote is at odds with the pension funds. Both CalPERS and CalSTRS have adopted so-called engagement policies instead of divestment. Last July, Anne Simpson, the senior portfolio manager and director of global governance for CalPERS, wrote in an op-ed for the Sacramento Bee that CalPERS has been “at the forefront of tackling climate change issues through policy advocacy, engagement with companies and investments in climate change solutions,” and that “divestment means losing a seat at the table” to press for these kinds of changes. CalSTRS spokesperson Ricardo Duran told the Express that CalSTRS is studying the climate threat of coal, but that the fund has made no commitment to divest. It’s not clear, however, that having a seat at the table has allowed CalPERS and CalSTRS to make any material impact on rising greenhouse gas emissions due to the mining and burning of coal by companies that the funds are invested in. For example, CalPERS and CalSTRS own a combined $8.1 million in Peabody Energy stock. Peabody is the largest coal producer in the United States. In 2009, Peabody mined 210 million tons of coal from the earth. The company’s coal production grew to 230 million tons in 2011, but then dropped for two years, mainly because of the global recession. Last year, Peabody’s coal production bounced back to 227 million tons, according to the company’s annual reports. The state Senate’s vote echoes a decision made last week by the Norwegian Parliament to divest the country’s $900 billion sovereign wealth fund from coal companies – against the advice of a group of finance professionals who, in a report released last November, urged the fund to remain an active investor in fossil fuel companies, including coal. CalPERS representatives did not immediately respond to information requests regarding the impact of their engagement strategies on the activities of coal companies.